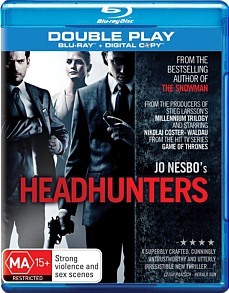 Headhunters Review. More thrilling than The Killing and every bit as gripping as any Stieg Larson flight of fancy, Headhunters is part heist movie, part chase film, and thoroughly exciting from beginning to end. Top notch stuff. It’s a mark of just how hot the Scandinavian crime genre is right now, thanks in large part to outings like The Killing and the exploits of a girl with a certain tattoo, that the remake rights and worldwide distribution to Norwegian-German Headhunters were purchased for substantial sums before it was even released to cinemas. Names such as Martin Scorsese and Mark Wahlberg are already being bandied about in preparation of a Hollywood remake, the film was a box office sensation in its native Norway and received rave reviews from critics the world over. Headhunters sees the talented Aksel Hennie starring as Roger Brown, a corporate headhunter who moonlights as an art thief to finance the high-rolling lifestyle he feels he requires to compensate for both his small stature and statuesque girlfriend Diana (comely newcomer Synnøve Lund). When a former mercenary turned CEO (Nikolaj Coster-Waldau, Game of Thrones) arrives on the scene, looking for both a lifestyle change and a buyer for a Rubens masterwork, Roger thinks he spies another easy mark and possibly just a retirement score. But he’s very possibly just met his match, and once the hunter becomes the prey the stage is set for one of the most cunning and solidly crafted crime flicks of recent memory. It’s difficult to give too much more of the plot away without spoiling its many surprises, but needless to say it doesn’t disappoint. Each of its leads puts in an impeccable performance and the film has been expertly cast - impossibly handsome Nikolaj ‘Jaime Lannister’ Coster-Waldau is the perfect foil for the unlikely protagonist, whom the viewer is expertly manipulated to identifying with due to his many believable misadventures, and both Lund and The Killing’s Julie Ølgaard engender a further air of mystery as the story’s femme fatales. But it is Hennie who really carries the show, putting in the performance of his career as the beleaguered art thief in well and truly over his head. More thrilling than The Killing and every bit as gripping as any Stieg Larson flight of fancy, Headhunters is part heist movie, part chase film, and thoroughly exciting from beginning to end. Top notch stuff.